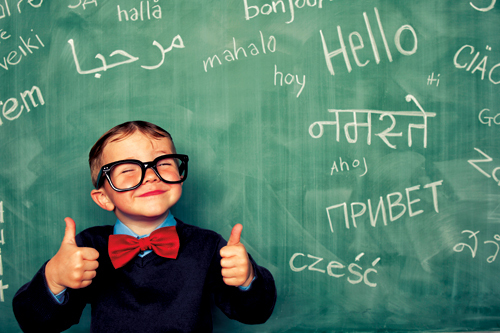 If you grew up bilingual, then one of your parents probably has an accent. You might have been embarrassed at it some point in your life while growing up (probably during your obnoxious teenage years), but finally realized how awesome your mother’s accent is. Here is a list of why your mother’s accent rocks. 1- Because having an accent means she learned another language, and research continues to show the benefits of being bilingual. 2- Your mom can tell you “I love you” in two different languages. 3- Your mom can discipline you in a language nobody else will understand in public. 5- She will make you do things for her, like stay on the phone with customer service for hours and use the “They will not understand me if I talk to them” excuse. 6- She will ask you to write important e-mails to people from her e-mail address and trust you to do so. 7- She will text you to ask if a certain sentence is grammatically correct and if a word is spelled the right away. 8- You can have a conversation in your own about the rude cashier and discuss if you should complain to the manager or wonder if she’s just having a bad day. Meanwhile, the cashier lady will continue to give you death stares. 9- She will scroll through Facebook and come across a bad word and ask you what it means. Then you try to figure out how to explain the vulgar word to her and avoid getting yelled at. 10- She gave you the gift of being bilingual and her accent simply means she learned another language at an older age, and she’s absolutely amazing, and you are so thankful for her, accent and all. It is not unlikely to meet a person who is a second-generation immigrant who speaks very little of his parent’s native language. I have met several people whose families immigrated to the U.S. years ago, but unfortunately the children grew up speaking only English at home, and the parents did not spend time or make the effort to teach them their native language. Some will understand just basic words of their native language while others can speak the language, but not read or write it. Why does this happen? Why would one disregard his native language and forget about his culture when there are so many benefits to being bilingual? One major reason I’ve heard is “Why do I need to learn my parent’s language if I’m living in the U.S.?” Another reason I’ve heard was from parents themselves who said they only taught their children English because they wanted desperately for their children to fit in society, and it was hard enough to live in a completely different culture. But that’s the beauty of America: You can speak several languages, you can have a thick accent, you can wear different clothes, you can eat unconventional food and you can love two countries and be a hyphenated American. I was fortunate enough to be raised in an Arabic-speaking home in the U.S. My parents were strict about preserving the Arabic language and culture– we had a strict “speak Arabic only at home” rule. My parents took us to Egypt every single summer to make us reconnect with our relatives and to be fully immersed in an Arabic-speaking country. This made me admire Egypt and Egyptians. I would look forward to going back every summer to spend time with my cousins, take Arabic and history classes, listen to stories by grandmother, explore the buzzing streets of Cairo, eat authentic Egyptian food in my hometown, Zagazig, and teach at local charity organizations. But not all families value their native culture and language. Or maybe parents realize how valuable that preservation is when their children are grown and don’t speak a word of their native language and want nothing to do with their parents’ culture and are unable to communicate with their grandparents and relatives. Some young adults realize how they missed on such an incredible opportunity when they see others who are bilingual and the many benefits. IS IT TOO LATE TO REDISCOVER ONE’S OWN ORIGINAL HERITAGE AND LANGUAGE? OF COURSE NOT. Although studies have shown when one learns a new language at an older age will most likely have an accent and may not be as fluent, there is nothing wrong with that. It may be challenging to “relearn” a new language but there’s also the advantage of having your family to practice with. This would be good time to ask your parents everything about their culture and home country. Ask question, listen, and learn about their country’s history, cultural practices and how they grew up. Another advantage to wanting to rediscover one’s culture would be to travel to one’s parents’ home country. Yes, traveling to a different country may be expensive and overwhelming at times, but if you have relatives there, think of all the advantages you will have: Free housing (if your relatives let you stay with them), being exposed to authentic food, music, entertainment, and most importantly, being fully immersed with that country’s language. Living in your parents’ home country for a year or two will help you rediscover the beautiful culture and language you missed out on as a child and reinforce the importance of teaching it to your own children. But don’t stop there: It’s just as important to give back to one’s hometown community as it is to rediscover his heritage. Many families immigrate to the U.S. for better education and opportunity. What better way to make use of one’s education and resources than to give back to his family’s hometown? This could be as simple as tutoring a child in the community, teaching an older person to read and write, or setting up a small class for people who are interested in learning English. And after rediscovering one’s culture and relearning the language, the most important thing is to pass down this priceless, precious knowledge and memories to your own children.